I love the second one <3 the studs are FIERCE & badass! so glad to see your second option since it looks just like a vintage one i scooped up last weekend. now i'm really inspired to try it out! Hi Cate-yes, this is my fave too, more for a party or evening wear!! Hi Janet Taylor-yes, its my fave too! Hi angel-perfect with skinny jeans I think! Hi yiqin-I agree, its gorgeous! Hi emily-hope to see your version, it sounds lovely!! Hi ren-yes, it really brightens things up, thanks my dear! 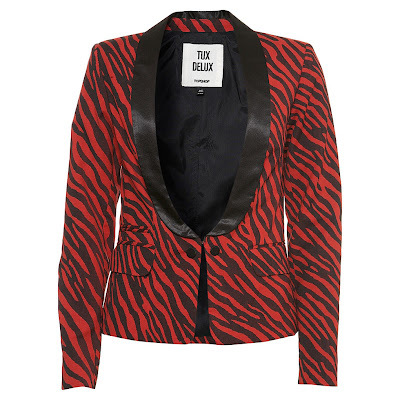 The zebra one just gave me a serious flashback to my '80s wardrobe. Eek! sharon, i will take the red please. 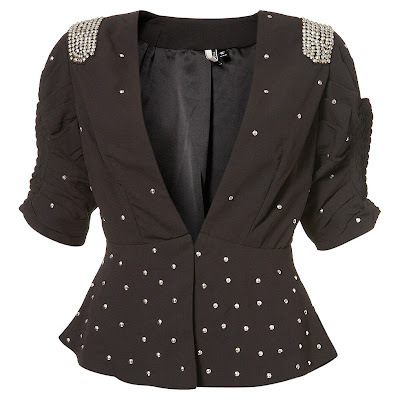 Love the studded jacket! Hope you are having a great weekend!! I adore the first one, I've tried that one on in the turquoise and the purple too, they are so smart. Love the lapels. Oh my gosh, the 3rd blog I've read today that references the tux jacket, but by far the most jaw-dropping example of one! I love the pattern, cut and colours on that zebra print. I need a tux jacket immediately. I love all of them! Are you going to purchase any of them? Hi Wendy-LOL, think Balmain, I'm sure thats the idea!! Hi Sal-yes, Love this one too! Hi Marte-yes, me too! have a lovely weekend! Hi Savvy-yes, you and me both! Hi Silje-yes it rocks!! have a good weekend too my dear! Hi Winnie-yes, the lapels drew me in too! Hi Miss Victory-yes, it sure is a statement piece! Have a lovely weekend! Hi Asian Cajuns-I love the 1st one, but I've got soo many, haha! Have a great weekend Sharon Rose! Hi laMimi-thanks for such a lovely comment and wish you a lovely weekend too my dear! 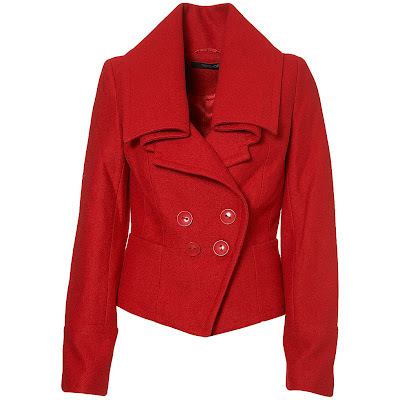 Oh I love that first red jacket!!! Also hope things are getting on track with your family. Hi the seeker-thanks for your lovely comment, the family are feeling better thanks, but the car is still poorly, haha! I adore the red one!! Hi Renate-thanks so much my dear! That first jacket is GORGEOUS! Hi anny-yes, a lot of these are in the sale now as well!